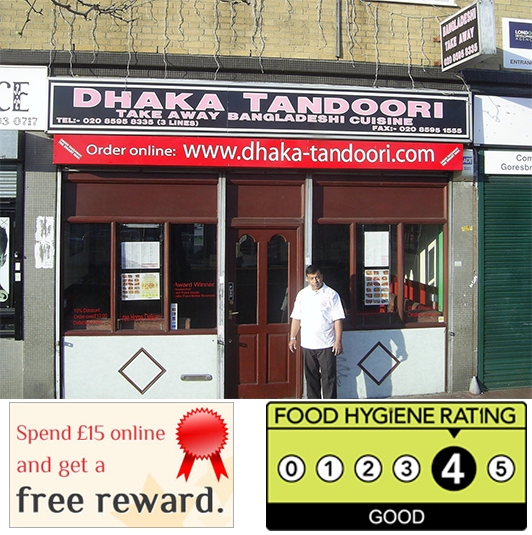 The Dhaka Tandoori Takeaway restaurant has been based in Dagenham since 1995. We strive to provide our customers with the very best authentic Indian food and delicacies, cooked from the very best eastern spices. We specialise in Tandoori, Curry, Seafood, Vegetarian and Balti-style dishes, all cooked using fresh ingredients, moments before these are brought to your door. Our first class customer service will ensure that your meal is catered to your taste. Just ask our staff who are happy to provide you! the customer, all you need to know about our menu and the wide selection of choices. We will gladly prepare a dish you require that does not appear on the menu, time permitting. Your comments and suggestions are always welcome. When you order online and collect your order. Simply select 'Collection' in the checkout and the system will automatically apply the discount. 20% Discount excludes set meals or special offers.